Like many, I have been watching the Olympics as much as possible. The usual disappointing local TV viewing choices not withstanding, it’s tough not to get sucked into its excitement. The talent and obvious hard work that goes into these athletes just getting there is impressive, often inspirational. So as with everything I do, I look for some correlation to Internet Marketing and one thing that often strikes me with the Olympics is the Gold obsession. Apparently Silver is no good and Bronze, well you may as well just give it back. For the record, I don’t think that at all. Just getting there is impressive enough for me. So for the Google keyword Olympics, let’s have a look at some connections. It’s generally considered that past Page 3 on the results won’t generate a whole lot of traffic. folks will do another search before they dig through the pages further. So I think it’s safe to suggest that if you can get a result on the first 3 pages for any given searched keyword, you’ll get some action. Even just getting to the Olympics is an achievement. You have to go through a lot to get there. So too, even for the lower searched keywords. There’s pretty much always competition. Sometimes you can luck your way in. Sometimes you may get there without trying too hard but overall, it takes some work. 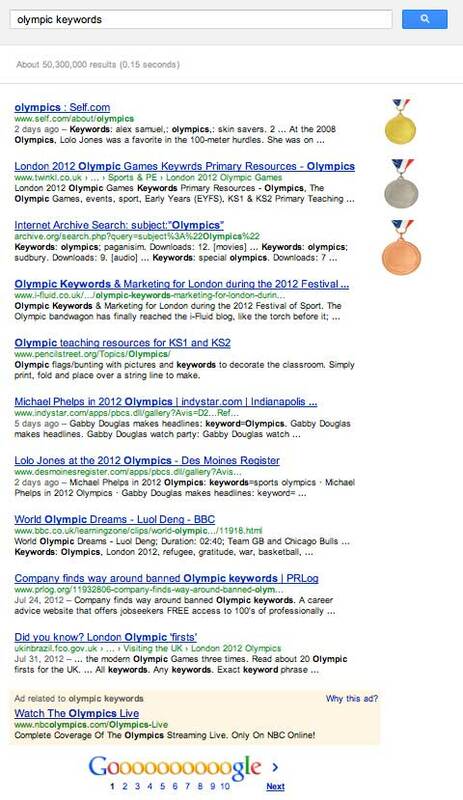 Even with a top 3 page result, it’s not going to be good enough, you want a medal. If the website is to be a valuable business component, you’re going to want to shoot for the top. There’s definitely something to be said for that top spot. Statistics tell us as a general rule that on a Google search #1 spot gets 38% of clicks, 2nd gets around 20% and 3rd is about 10% and then it’s downhill from there. Excluding geotargeting and personalized results etc, the differences between the top 3 spots can sometimes be pretty significant. 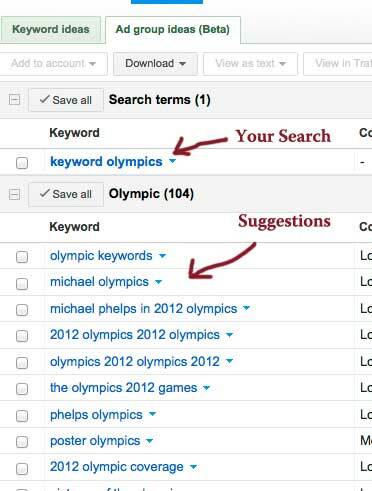 So naturally the best thing to do is shoot for #1 for the most popular keyword right? Well there’s a bit more to it. If you are 5’3″ does it make sense to compete as a high jumper? How about a 120lb shot putter? Might need a reality check. You still need to determine what is relevant to you and what is achievable. Usually you get to figure that out during the early years of your sporting life through participating in various activities which sport you have a thing for. Some may get pushed into it and some occur randomly but you kind of know what you’re good at. Keyword selection is a little like this as well. You have some initial figuring out to do. You do some research. You see if anything is currently performing via your analytics. You ask people around you. You use your gut instinct…cannot discount your gut. For us, experience helps as well but you’re probably going to have to earn that. Part of your initial figuring out requires some data crunching. Have a look at some data through the Google External Keyword Tool. When searching for ideas, it offers up some similar suggestions that you may not have even considered. In addition you will get numbers of searches and a rough estimation of competition. All very valuable information to start with. Having held and still holding top spots on some very competitive keyword phrases, you can really get a sense for what’s going to work but even as we look to get to know a company, what they do and what services they offer, we cannot know it as well as those in the trenches. Our greatest successes come when working closely with clients during this initial part of the process. I’ve seen stuff. I’ve targeted the right keywords as well as the wrong ones. Some of my research has fallen short while others has exceeded expectations. My best advice is not to rely on data alone. Start with the Data – while some may start and finish with the data, this is a shortcoming for young players. You cannot rely on data alone to drive your keyword selection otherwise you are setting yourself up for failure. You can do as many searches v competitors v kei as you like, it’s more nuanced than that. Still, this is a good starting point and one that should serve as a foundation. You’re a good swimmer? Well there are still a few options to choose from. Butterfly. Backstroke. Breast Stroke. Freestyle. You sell books? Used Books. New Books. Old Books. Rare Books. Add some Relevance – you’re a good swimmer so maybe you should try diving? There’s a pool with water and stuff so you should do that as well as the 100 fly. Probably not a good idea. Scrap the keyword phrases that are ‘loosely’ related because they ‘might’ garner you some traffic. Chances are they either won’t, they’ll be the wrong kind of traffic and they’ll take your focus. Play Your Strengths – keeping your focus can be tough especially when you want it all. You’re an injury lawyer, a defense lawyer, a memphis attorney, a maritime lawyer and a real estate litigator so naturally you’re inclined to go for them all. Figure out what you are best known for or choose a couple to start with. You can build out once you start to gain traction but for the most, there’s much work to be done to begin with. Be Patient – Slightly antithetic when you’re talking about the Internet but like top athletes, you’re not going to get gold right away. Lots of work, practice, perseverance, missteps, victories, adjustments required along the way so don’t give up after week 1. Is this the same Paul Fleming I used to know from approx 20 years ago (ekk!) in Australia working in the food business? If so, please drop me a line matey… I have wondered for years what you have been up to ol’Flemo! How funny! Well I was living in Oz 20 years ago but not the food industry I’m afraid except for a stint picking grapes (if you can call that the food industry). There’s no shortage of Paul Fleming’s though and the chances of their nickname being Flemo is generally pretty high!